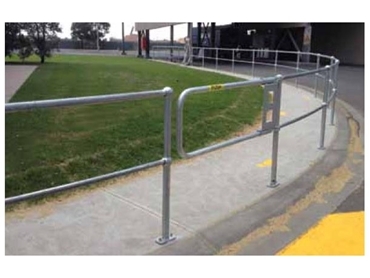 Ball-fence modular hand rail systems from Barrier Group include stanchions in a range of configurations, a top (hand) rail and a centre (knee) rail. The ball-fence excels in design flexibility and usually it’s components are assembled on site. If required they can be assembled in a factory and deliver to site in sections for simple fixings with charges applied. Ball-fence gates are also available from Barrier. Supplied with ball-fence installations or retrofitted to existing ball-fence sites, the self closing gate system can be installed within minutes for both left or right hand operation and can open in or outwards. Total flexibility of use is ensured with adjustable hoop length and return gas strut and the ability to hot dip galvanise or powder coat gives an option of indoor or outdoor use. The ball-fence gates come complete with a standard galvanised tubular hoop which suits a 1500mm opening for single gates or 3000mm for double gates. The hoops can then be cut down and fitted to the receiver tubes on the gate assembly.